April 4, 2019 New Delhi, India – His Holiness the Dalai Lama is in Delhi for the Global Launch of the Social, Emotional and Ethical Learning (SEEL) (Social, Emotional and Ethical Learning) program developed at Emory University, Atlanta, Georgia, USA. However, to begin with today, he met with Venkat Krishnan the founder of Daan Utsav – Festival of Giving – who requested him to give a message to all who will participate in the Joy of Giving Week 2-8 October this year. Krishnan told him, “We want people to realize that having compassion for others doesn’t make you sad, it makes you happy.” His Holiness replied, “We are social animals who biologically need karuna or compassion and as long as we have compassion, we’ll be physically and mentally fit. This is something scientists now recognize. Encouraging more people to experience this is the best way to create happy individuals, families, communities and in fact a happier humanity. Next he met with about 80 students and teachers from South Asian countries, who represent 300 students who have been taking part in workshops about universal values and secular ethics. Rajiv Mehrotra, Secretary of the Foundation for Universal Responsibility, which has organized the workshops, gave an introduction. He said the aim had been to strengthen young people’s capacity to develop compassion, universal responsibility and a respect for diversity. Students from South Asia were encouraged to embrace positions that were acceptable to faith traditions and agnostics alike, engaging with issues across religious and ethnic divides. He pointed out that because of differences in individuals’ receptivity immersion programs were necessary to enhance transformative change. Mehrotra described education in inner values as a lifelong process and suggested that schools and colleges can function as places of healing that can prevent the growth of hatred and fear. They can instead become places of true development. “When I received the Nobel Peace Prize,” His Holiness responded, “I gave half the prize money to Baba Amte to support the excellent work he was doing to help lepers in his ashram. The other half I gave to the Foundation for Universal Responsibility and asked Rajiv to take action—with this program, among others, he has. Young children don’t care about differences of religion or nationality. But once they enter the education system they learn to emphasise such differences. Meanwhile, education today doesn’t have much to say about inner values. “Nevertheless, this country has longstanding traditions of ahimsa and karuna, non-violence and compassion. And the practices of shamatha and vipashyana have given rise to an understanding of how to train the mind. Modern education does a wonderful job of providing for material development, but neglects this other aspect of human knowledge. His Holiness told a young Afghan woman who wanted to know how religion can help us work for peace that the key lies in education; that is what will be most effective. A young man from Kathmandu, Nepal heard that acting with compassion counters loneliness and makes you happy. A Bangladeshi student learned that since negative emotions are based on ignorance, the remedy is to develop wisdom understanding reality. His Holiness advised a young Sri Lankan woman that sometimes following secular values is the most effective course. His Holiness advised a young woman from Manipur, North-east India, who wanted to know how cultivate peace within herself, to read Shantideva’s ‘Guide to the Bodhisattva’s Way of Life’. He told her to pay attention to the instruction to exchange selfish attitudes for concern for others because if you remain selfish, others will seem like adversaries, whereas it’s much better to see them as friends. The meeting concluded with a representative from Sikkim making an offering to His Holiness on behalf of the group. Shortly after he entered the room where members of the press were assembled, His Holiness’s old friend Richard Moore arrived. Referring to him as ‘his hero’, His Holiness explained that Moore is a living example that human nature is compassionate. He recounted that as a young boy in Northern Ireland Moore had been struck by a rubber bullet and rendered blind. In due course he found the British soldier who had shot him and forgave him. As friends the two have worked to help other children caught in crossfire. Answering questions in Tibetan from Voice of America, Radio Free Asia and Voice of Tibet correspondents, His Holiness told them that the practices of loving kindness and wisdom that are part of the Nalanda Tradition are something to be proud of. They are kept alive through study and practice as can be seen in the Seats of Learning re-established in South India. Dr Brenda Ozawa de Silva, moderator of the press meeting, gave an introduction in lieu of Dr Lobsang Tenzin Negi. He mentioned that His Holiness’s relationship with Emory University goes back to 1998 and the launch of Cognitive Based Compassion Training (CBCT). Later, there was collaboration is developing science training for Tibetan monasteries. SEE Learning is the latest program which seeks to provide a comprehensive approach to holistic education. He invited His Holiness to make his remarks. 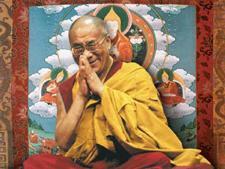 “The existing education system is inadequate,” His Holiness replied, “with no guarantees that it will bring happiness. Education should include ways to reinforce warm-heartedness. All religious traditions convey such a message, but in today’s world at least 1 billion have no interest in religion. To illustrate this she told a story about a group of teenagers she’d been working with in a poor part of New York. All of them had lost a friend or relative to violence. Their teacher asked them to share a goal for when they were 21 and she remembered one, Eugene, who said, “To be alive at 21″. Not long afterwards the teacher called her with sad news about Eugene. He’d been shot from a passing car and would never walk again.